This article is about the cabinet of Ireland. For the government in Northern Ireland, see Northern Ireland Executive. The Government of Ireland (Irish: Rialtas na hÉireann) is the cabinet that exercises executive authority in Ireland. The Constitution of Ireland vests executive authority in a government which is headed by the Taoiseach, the head of government. The government is composed of government ministers, all of whom must be members of the Irish parliament. The Taoiseach must be nominated and approved by the Dáil Éireann, the lower house of the Oireachtas, the Irish legislature. Following the nomination of the Dáil, the President of Ireland appoints the Taoiseach to his role. The President also appoints members of the government, including the Tánaiste, the deputy head of government, on nomination of the Taoiseach. The government is dependent upon the Oireachtas to make primary legislation and as such, the government needs to command a majority in the Dáil in order to ensure support and confidence for budgets and government bills to pass. The Government is also known as the cabinet. The current Taoiseach is Leo Varadkar who took office on 14 June 2017. He is the leader of Fine Gael, the party with the highest number of seats in the Dáil. Varadkar's government is a minority coalition, made up of Fine Gael and independent members. His Tánaiste is Simon Coveney who took office on 30 November 2017. Membership of the cabinet is regulated by Article 28 of the Constitution of Ireland and by the Ministers and Secretaries Acts 1924 to 2017. The Irish constitution requires the government to consist of between seven and fifteen members, all of whom must be a member of the Oireachtas. Since the formation of the 12th Government of Ireland in 1966, all Irish cabinets have been formed with the constitutional maximum of fifteen ministers. The total sometimes falls below this number for brief periods following the resignation of individual ministers or the withdrawal of a party from a coalition. Members of the government in charge of Department of State are designated Ministers of Government (before 1977 a Minister of State). For distinction, Ministers of State (known before 1977 as Parliamentary Secretaries) — informally called junior ministers — are not members of the Government, but assist the Government Ministers in their Departments. A minister without portfolio may be appointed to the Government who is not the head of a Department of State; this occurred in 1939 during the period of the Emergency when Frank Aiken served as Minister for the Co-ordination of Defensive Measures until 1945. Non members have no voting rights at Cabinet but may otherwise participate fully, and normally receive circulated cabinet papers on the same basis as a full member of Government. Votes are rare, however, with the cabinet usually following the Taoiseach or working by consensus. The Government is advised by the Attorney General, who is not formally a member of the Government, but who participates in cabinet meetings as part of their role as legal advisor to the Government. The Chief Whip may attend meetings of the cabinet, but is not a member of the Government. In addition, the Government can choose other Ministers of State, who may attend cabinet meetings. This person is informally known as a "super junior minister". The current super junior ministers are Paul Kehoe, Mary Mitchell O'Connor and Finian McGrath. The Government continues in office until the nomination of a new Taoiseach by Dáil Éireann. This will either be after a general election, or after the nomination of a Taoiseach during the lifetime of a Dáil term. A Dáil term may last no longer than five years by law, though the constitution allows seven. Most governments in recent years have served 4 to 5 years. The Government must enjoy the confidence of Dáil Éireann if it is to remain in office. If the Taoiseach ceases "to retain the support of a majority in Dáil Éireann", either Dáil Éireann must be dissolved or the Taoiseach must resign. This applies only in cases of a no-confidence vote or loss of supply (rejection of a budget), rather than a government bill being rejected. The President may refuse to grant a dissolution to a Taoiseach who does not enjoy the support of the Dáil, thus forcing the resignation of the Taoiseach. When the Taoiseach resigns, the entire Government is deemed to have resigned as a collective. However, in such a scenario, according to the Constitution, "the Taoiseach and the other members of the Government shall continue to carry on their duties until their successors shall have been appointed". The Taoiseach can also direct the President to dismiss or accept the resignation of individual ministers. Upon the dissolution of Dáil Éireann, ministers are no longer members of the Oireachtas, and therefore at first glance ineligible for office. However, under a different clause in the Constitution, they "shall continue to hold office until their successors shall have been appointed". Unlike the cabinets in other parliamentary systems, the Government is both the de jure and de facto executive authority in Ireland. In most other parliamentary regimes, the head of state is usually the nominal chief executive, though bound by convention to act on the advice of the cabinet. In Ireland, however, the Constitution explicitly vests executive authority in the Government, not the President. The state may not declare war, or participate in a war, without the consent of the Dáil. In the case of "actual invasion", however, "the Government may take whatever steps they may consider necessary for the protection of the State"
Treaties must be laid before Dáil Éireann. The Government must act in accordance with the Constitution. Government ministers are collectively responsible for the actions of the government. Each minister is responsible for the actions of his or her department. Departments of State do not have legal personalities. Actions of departments are carried out under the title of ministers even, as is commonly the case, when the minister has little knowledge of the details of these actions. This contradicts the rule in common law that a person given a statutory power cannot delegate that power. This leads to a phrase in correspondence by government departments, "the Minister has directed me to write", on letters or documents that the minister in question may never have seen. The functions of government ministers are frequently transferred between departments during cabinet reshuffles or after elections. On occasion, a ministerial position will cease to exist, as its powers are entirely transferred to another office. Such defunct ministerial positions include the Ministers for Labour, Posts and Telegraphs, Public Service and Supplies. If the Government should fail to fulfil its constitutional duties, it may be ordered to do so by a court of law, by a writ of mandamus. Ministers who fail to comply may, ultimately, be found to be in contempt of court, and even imprisoned. The First Government of Ireland took office on 29 December 1937 on the coming into force of the Constitution of Ireland. It was preceded by the Executive Council of the Irish Free State, which operated from 1922 to 1937 as the executive of the Irish Free State. The detail and structure of the Government of Ireland had its legislative basis in the Ministers and Secretaries Act, 1924; it has been amended on a number occasions, and these may be cited together as the Ministers and Secretaries Acts 1924 to 2017 and are construed together as one Act. All Governments from 1989 to 2016 were coalitions of two or more parties. The first coalition government was formed in 1948. The Taoiseach has always been a member of the largest party in the coalition. The Taoiseach has almost always been the leader of that party, with John A. Costello, Taoiseach from 1948 to 1951 and from 1954 to 1957, the only exception to this rule. The public service in Ireland refers to the totality of public administration in Ireland. As of Q3, 2016 the total number of employees in the Irish public service stands at 304,472 people. 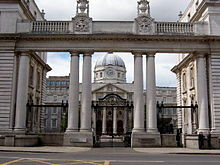 The Department of Public Expenditure and Reform defines the public service as comprising seven sectors: the Civil Service, Defence Sector, Education Sector, Health Sector, Justice Sector, Local Authorities and Non-Commercial State Agencies; such as Bord Bia, IDA Ireland and the Commission for Energy Regulation. Commercial state-owned bodies such as RTÉ, ESB Group and An Post are not considered part of the public service in Ireland. The largest sector is the health sector with over 105,000 employees (largely in the Health Service Executive), followed by the education sector with approximately 98,450. The civil service of Ireland consists of two broad components, the Civil Service of the Government and the Civil Service of the State. While this partition is largely theoretical, the two parts do have some fundamental operational differences. The civil service is expected to maintain political impartiality in its work, and some parts of it are entirely independent of Government decision making. Leo Varadkar was elected as Taoiseach by Dáil Éireann on 14 June 2017, and the Dáil approved the new government later that day. Ministers are listed here by seniority. ^ "Ministers and Secretaries Act, 1924 (Section 2 – Ministers to be corporations sole and to have certain powers.)". Attorney General of Ireland. 1924. Retrieved 22 January 2011. ^ "History of Government – Eighteenth Dáil". Department of the Taoiseach. Retrieved 23 January 2018. ^ Constitution of Ireland, Article 28, Section 2, Subsection 2. ^ Constitution of Ireland, Article 28, Section 2, Subsection 1. ^ a b O'Toole, John; Dooney, Sean (24 July 2009). Irish Government Today. Gill & Macmillan Ltd. p. 9. ISBN 9780717145522. ^ "History of Government – Seventh Dáil". Department of the Taoiseach. Retrieved 23 January 2018. ^ "History of Government – Eighth Dáil". Department of the Taoiseach. Retrieved 23 January 2018. ^ "Ministers and Secretaries (Amendment) (No. 2) Act, 1977 (Section 4 – Amendment of Interpretation Act, 1937)". Attorney General of Ireland. 1977. Retrieved 22 January 2011. ^ "Ministers and Secretaries (Amendment) Act, 1939 (Section 4 – Minister without portfolio)". Attorney General of Ireland. 1939. Retrieved 22 January 2011. ^ a b "The Appointments". The Irish Times. 11 March 2011. Retrieved 7 September 2011. ^ "Finian McGrath willing to enter government with Sinn Féin or Fianna Fáil". Irish Examiner. 4 January 2019. Retrieved 23 March 2019. ^ "Taoiseach Leo Varadkar announces new Cabinet positions". RTÉ News. 14 June 2017. Retrieved 23 March 2019. ^ Constitution of Ireland, Article 28, Section 10. ^ Constitution of Ireland, Article 28.11. ^ Constitution of Ireland, Article 28, Section 3. ^ "Department of Public Expenditure & Reform - Databank - Public Service Numbers". Department of Public Expenditure & Reform. Retrieved 8 January 2017. ^ "Oireachtas Debates Nomination of Taoiseach (Resumed) (Continued) Wednesday, 14 June 2017". Houses of the Oireachtas. Retrieved 5 December 2017. ^ "Appointment of Taoiseach and Nomination of Members of Government Wednesday, 14 June 2017". Houses of the Oireachtas. Retrieved 5 December 2017. ^ "List of Ministers and Ministers of State". Department of the Taoiseach. Retrieved 5 December 2017.